Many years ago I sailed through the Sea of Cortez searching for whales with my brother. I flew into Cabo San Lucas, but spent as little time there as possible. To me, Cabo was just another spring break destination for college kids. I imagined that for the rest of the year it would be a place for people to go who didn’t want to exchange their money and never leave the hotel. On my more recent trip to Cabo, it was meant to be an endpoint, a place where I’d spend a night or two, rest up, and then hit the road again on my 2000 mile round trip journey through the Baja peninsula. In many ways, I’m glad that there are a lot of people who share my opinion about Cabo, and I want it to stay as it is, but at the same time I feel like I should set the record straight. This is not the Cabo we’ve seen on television. Sure, the occasional party boat drifts by, with drunk foreigners dancing to outdated techno songs with the bass turned up way too high. The vast majority of people roll their eyes as they watch the last remnants of the party crowd struggle to keep the festivities going like the drunk guy that tries to get everyone to dance at a swanky lounge. My two-day rest stop turned into a week of exploring one of my favorite new destinations in the Americas; here are seven photos that show why I’ve changed my mind about Cabo. It’s easy to find solitude. When was the last time your footprints were the only ones in the sand? Cabo itself is situated on a beautiful bay, with hotels lining the coast, but just outside of town the beaches are empty. I’ve surfed this spot a handful of times and I’ve never seen someone in the water that I didn’t invite. 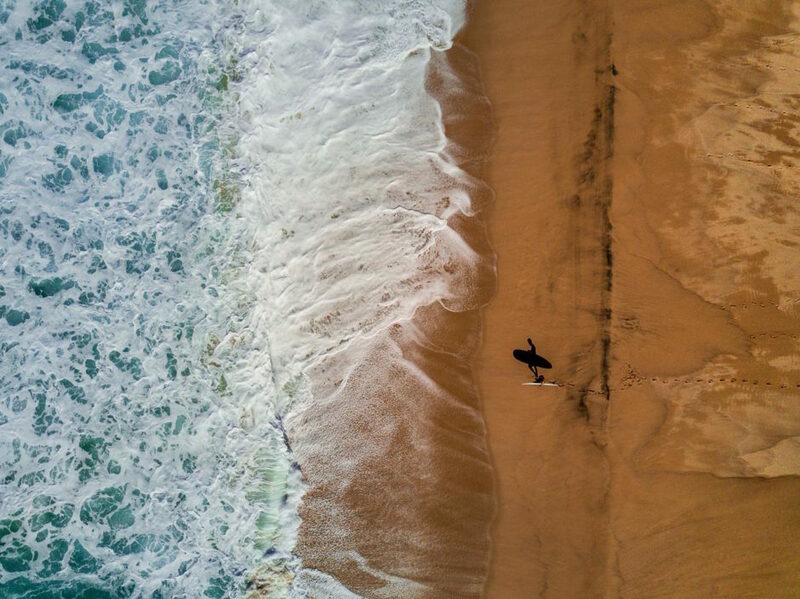 The Baja peninsula sticks out into the pacific and catches swell from just about any direction. The waves are actually really good, and there are enough secret spots and sandbars along the coast to keep you entertained. The water is clear and warm. Every morning we’d get up at dawn and jump in the water for a sunrise swim. The town, and the tourists, would still be asleep. The water here is far warmer than the southwestern coast of the United States, and the clarity is incredible. Chill at a classy joint on the beach between adventures. I was expecting obnoxious beach bars and constant attention from people trying to sell me nicknacks. In truth, it’s really easy to find a classy joint where you can have a fancy drink or top notch breakfast right on the water's edge. My favorite hangout was the SUR Beach House, and I found myself there every day for breakfast and lunch. Eventually, they even let me in for coffee before they opened up for the day! The arch is hidden from view from most of Cabo, but it’s just about the perfect distance for a paddle boarding adventure. 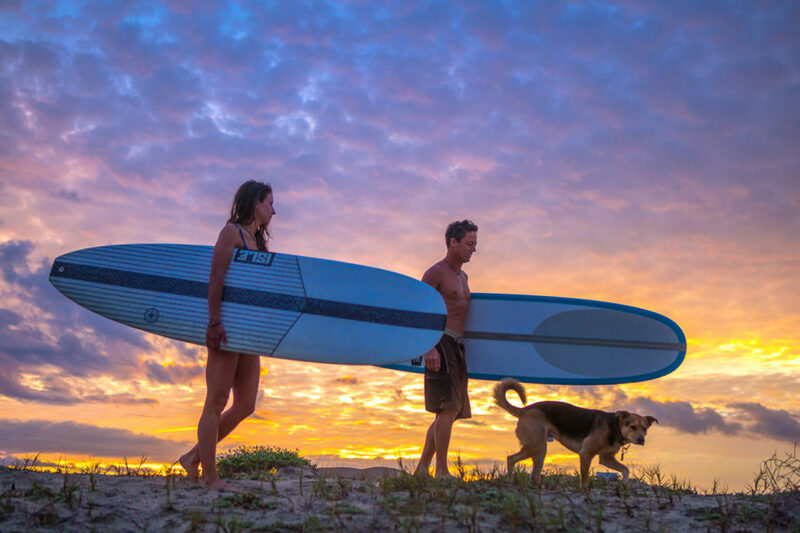 I was working with Isle Surf and SUP so I had my own boards, but you can rent boards or even take a paddle boarding tour at Sur as well. I’d recommend getting on the water at sunrise for the best view, and getting out early is especially nice because the boats aren’t allowed to run around the harbor until 8:00. 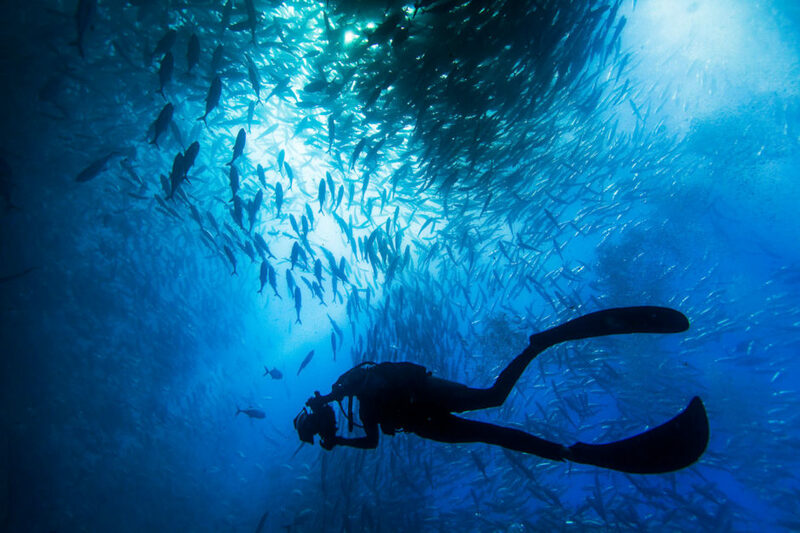 Cabo is more than just nice hotels and beautiful views. 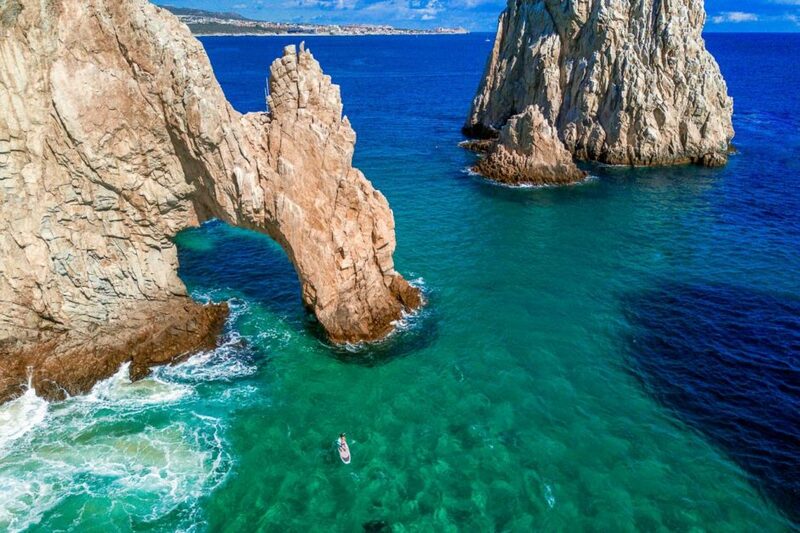 It’s situated at the very tip of the Baja peninsula where the Sea of Cortez and the Pacific merge. The sea life in the region is some of the most fantastic on the continent. 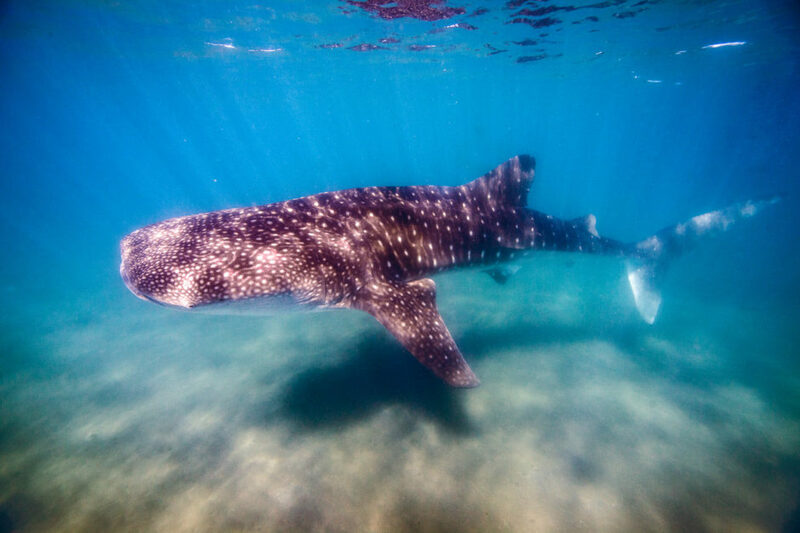 We linked up with Cabo Expeditions for a few days of adventures and for me, the highlight was diving with whale sharks. These animals are the largest fish in the world, and no picture will ever do justice to the feeling of swimming alongside an animal the size of a school bus. One of the days we spent with Cabo Expeditions was in Cabo Pumo, a National Park between Cabo and La Paz. 20 years ago, the fishermen in this area turned into conservationists, and instead of surviving off of the fish, they helped protect the area and make their living taking divers out to see the massive schools of fish, and the large marine animals that inhabit the area. In those 20 years, the parks biomass has increased by over 900%, and I got to dive with the largest school of fish I’ve ever experienced. Bring your surfboards, paddleboards, mask and snorkel, and spend as much time in the water as you can handle. I stayed at the Bahia Hotel, and was incredibly happy with how I was treated. The owners are an American couple who are striving to keep the authenticity and history of Cabo alive in their hotel, and they’ve done a great job finding the best chefs in town to run their Hotel Restaurant “Esquina.” Cabo Expeditions really hooked it up and took us to some amazing places. Sometimes it’s great to hire someone who knows where to take you right away and not waste time trying to do it on your own like I usually do! Try the super cheap taco stands, but make sure to balance it out with a nice restaurant. The drinks at Templo were some of the best I’ve ever had, and the food was absolutely unreal. Get up early, take advantage of daylight, watch the sunrise, and explore outside the city. Lastly, pay in Pesos, the exchange rate right now is 20/1 so you can save a lot of money.